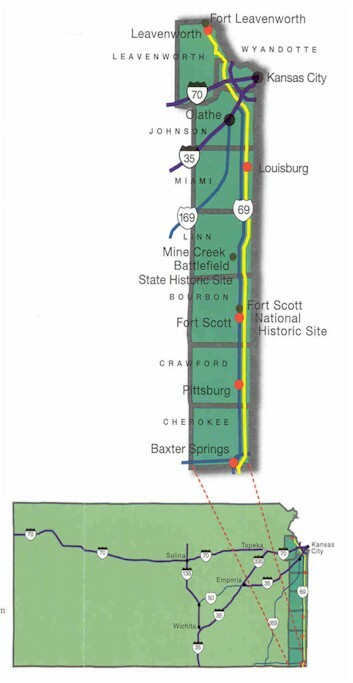 The Frontier Military Scenic Byway extends along the eastern edge of Kansas roughly 167 miles, tying Fort Leavenworth to the north with Fort Scott at the south and then onward to the Oklahoma border. It follows K-5 out of Leavenworth to I-435, then follows U.S. 69 and Alternate U.S. 69 to the state line. The route approximates the old military trail used by the Army to transport troops and supplies between the frontier forts. The Frontier Military Scenic Byway contains unique historic, natural and cultural attractions and sites. They include: Fort Leavenworth, Weston Bend Bottomlands, Wyandotte County Lake, Grinter Place, National Agricultural Center and Hall of Fame, Shawnee Mission Park, the Johnson County Museum, Legler Barn Museum, Ernie Miller Nature Center, The Prairie Center, Louisburg Cider Mill, Adair Cabin, Miami State Lake, Marais des Cygnes National Wildlife Refuge, Marais des Cygnes State Wildlife Refuge, the Chouteau Trading Post, Mine Creek Civil War Battlefield Site, Fort Scott National Historic Site, Fort Scott National Cemetery, Fort Scott Restored Victorian, Commercial and Residential District, Crawford State Lake, the prehistoric and Osage Indian site, Hotel Stilwell in Pittsburg, "Big Brutus" the second largest electric coal shovel in the world and Schermerhorn Park. There are recreational opportunities on or near the byway. In addition, a joint project by the Fort Scott Chamber of Commerce, Kansas Department of Wildlife and Parks and Quail Unlimited, is planting native wildflowers along the byway. The route is primarily two-lane, paved roadway with one interstate segment. It offers many amenities along the way. The local committee is in the process of developing additional amenities for the future including an outdoor reenactment site at Mine Creek Battlefield Site. Download the brochure for the Frontier Military Scenic Byway by clicking here.